The City of Boyne is in the process of developing plans to rebuild the entire length of Terrance Street and also West Cedar Street between Douglas and South Lake Streets in 2019. As proposed these projects will involve full street removal and replacement, curb and gutter improvements, water, sanitary sewer and storm water main replacements and sidewalk replacement. Preliminary plans for this work have been prepared and are available for review at City Hall or by clicking on the file link below. This project will be done at the City's expense and we will not be seeking any additional contributions from property owners. Project plans are currently being finalized and we would look to seek bids on the work this winter when prices are usually at their lowest. If the bids come in within our budgeted amounts the work would be done during the 2019 construction season. Excessive bids could result in delays to all or portions of the project. The State recently changed requirements regarding water main replacements. Generally if any lead components are found leading to any customer’s service, that entire service line must be replaced into the structure by the City. You do have the right to opt out of this replacement. Although this requirement is being challenged in the courts we are currently proceeding as it is. We are excited about this project and to the proposed improvements to your neighborhood. Feel free to contact us with any questions or comments you may have. 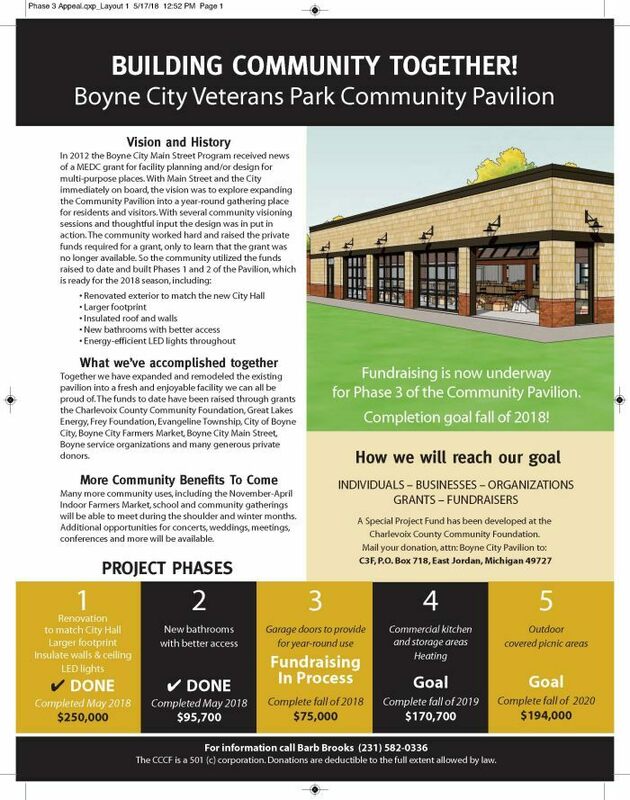 Questions and comments can be emailed to bbrooks@boynecity.com or call 231.582.0336. M-75 Mill & Resurfacing Project: MDOT is holding a public meeting on Tuesday, April 16, 2019 in the City of Boyne City Commission Chambers between 5:00 PM and 6:30 PM in order to outline its plans to mill and resurface M-75 throughout much of the city this spring. The 3 mile long project extends from Air Industrial Park Road to East Street, then along East Street to State Street, then along State Street/M-75 to Old State Road in Charlevoix County. The work will be done sometime between April 22, 2019 and June 7, 2019. The City is considering applying for a Michigan Dept. of Natural Resources (MDNR) Recreation Passport Grant to undertake major renovations at the Rivermouth Restrooms. The project is proposed to include, infrastructure improvements, fixture replacements, the addition of a family restroom and facade improvements.